tl;dr |✭✭✭✭✭| OH MY GOD. I need the third book, I need it right now. This book was SO GOOD! Read it. Go buy it, and read it. I received this arc from NetGalley in exchange for an honest review. 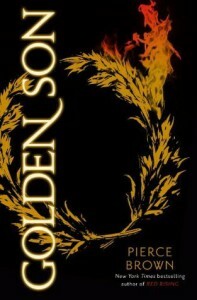 Description Two years have passed since the events of Red Rising, and Darrow has gone to the academy to become the top of his class. As he takes on one of the Bellona sons in a war simulation, he comes to learn not all is as it seems. When he fails his assignment to the Bellona, he quickly learns the consequences will be swift and they will be harsh. The head of the Augustus family has no need for people who cannot complete the tasks they set out to do. As Augustus prepares to leave Darrow on Luna, potentially to his death as every Bellona family member wants him dead, Darrow decides to shake things up. He won't go quietly after all, not after all he's already been through. He vows to tear down the society that stands on the backs of red slaves, and he's willing to give his life to the cause. Ok. So when I saw this was on NetGalley, I just had to request it. And when NetGalley approved me, I about died of happiness. And then the reading began. I mean, there's not a lot I can say because so much happens in this story, and I cannot spoil any of it. I can't. Right you are, dance master. Any who. What can I say to this book that is not spoiler related. It was amazingly done. There was absolutely none of the second book syndrome in this series, where the second book of the trilogy falls flat and is nothing more than something to push the plot forward. There is a lot of action in this book, its a wild ride from start to finish. And can I just say, I absolutely love that griffins are pets in this world, and where can I get one? Because I want Icarus. He's a magnificent beast, and as ridiculous as it is, the addition of dragons and griffins to this world basically made it even more perfect. Even though it ends up being such a small point in this book, especially compared to everything else that happens, but ohemgee do I love them. So thank you for that, Mr. Brown. Read this book people. Love this book. Be prepared for your mind to be blown. I have no words - at least, I have no words that do not contain spoilers. I love Darrow. I know some people found him whiney, but I didn't. He was perfect, and exactly what he would be in the situations he faced.